I would like you to meet my little family. From left to right Evie. Evie is a rescue American Cocker Spaniel whom we acquired in January 2014 at the age of 5. She has settled well into our little family and absolutely adores the company of our other two. Charlie in the middle is a Cavichon and is 6years old. He is a little poppet and is adored by everyone. And Last but not least is Daisy who is a 5 year old Cavalier. She thinks she is a little Princess and once met never forgotten ! My name is Jayne and my passion is dogs. After a life changing experience I decided that life was too short and to follow my heart. 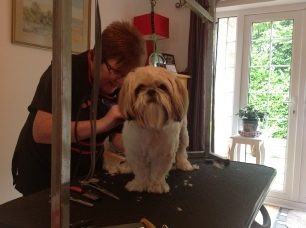 As I wanted to be a hairdresser when I was young I put hairdressing together with my passion of dogs and came up with the idea of being a dog groomer !! After finding the right training course I qualified and then set up Pawtraits and I haven’t looked back. I find it a privilege to be trusted with other people’s dogs and have built up a loyal client base over the years which I class as my extended family. I look forward to welcoming you to my family.